Courtesy photo The Graham Band is heading to Georgia over the winter break. 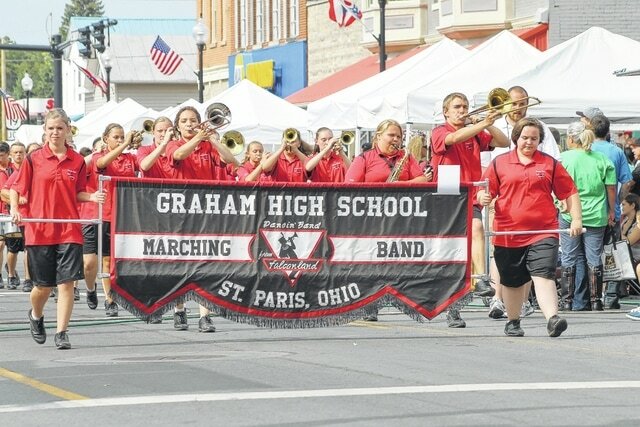 ST. PARIS – The Graham High School marching band will travel to Atlanta, Georgia, over the winter holiday break to perform at the Georgia Peach Bowl. The Falcons will take their unique and entertaining style of marching to perform with other bands from all over the country. The Dancin’ Band from Falconland, led by Director Justin Cooper, will leave on Dec. 28 and return to the area Jan. 1, 2016. The Band Parent Organization is organizing several fundraisers to help students defray the cost of the trip. The group is offering memberships to the 200 Club with part of the proceeds going toward the band trip and the other to the club members through a weekly drawing. Additional information can be found on the band’s website at www.grahamband.weebly.com.